Google Reader is 3 days dead, and now that it's clear that GR won't be rising from the grave I think it's time to post about the news reader service I chose to replace it. I am of course getting some of my feeds through BlogTrottr (here's why), but for my main feed reading needs I have chosen BazQux. This is one of the lesser known feed readers that have toiled for years in the shadow of Google Reader, and it only got the attention it deserved after the Readerpocalypse. I first encountered BazQux a couple months ago. It's a solid Google Reader clone that looks a little different from GR, but behaves enough like GR that the visual differences don't matter. BazQux caught my eye back in May because it offered a unique feature. It can automatically pull in comments on the post you are reading. I don't use that feature much at the moment, but it's nice to have the option. The comment feature is nice, but the main reason I am using BazQux and not Feedly is because the latter looks and behaves funky. I set out Sunday night to completely abandon GR and replace it with an alternative. Naturally I turned to Feedly, the heir apparent to Google Reader. This is an immensely popular news reader service and is probably the largest and most successful of the GR alternatives (barring Digg Reader and AOL Reader, neither of which are worth using ATM). Feedly might be popular, but after about 20 minutes I realized that this service irritated me enough that I could not use it for any length of time. And since I am looking for a news reader that I can use as a daily work tool, any service that can irritate me in under 20 minutes is simply not a viable option. This might sound silly, but my main objections to Feedly boils down to the way it behaves. I don't like how the list of feeds in the left panel pops out when my mouse hovers over it, and I don't like how Feedly bundles all of my unorganized feeds into a folder labeled uncategorized. If I wanted them in a folder I would have put them in one. Some people are probably rolling their eyes at how petty my objections are. Snicker all you want, but there are many, many GR alternatives that are no longer being overshadowed by Google Reader. With that in mind there is absolutely no reason not to switch from one service to another (assuming you can export your data). Speaking of data, one of the other reasons I switched to BazQux is that Feedly wouldn't let me re-import my Google Reader account. They also only sorta, kinda support exporting the list of feeds you follow. BazQux, on the other hand, let me import my GR account again, and it already supported exporting my feeds. That put BazQux a couple steps ahead of Feedly due to the fact that the latter is currently a cul-de-sac for my data. And the fact that BazQux supports searching within my feeds (a feature that Feedly has yet to add) is a plus. It has been 4 days since I switched to BazQux, and I am now convinced that this is the news reader for me. It's reasonably fast, supports my 2k feed collection without complaint, and I can pester the developer with questions. P.S. I'm still looking for a mobile solution for BazQux. This service doesn't have any apps, but it is integrated into a few independent news reader apps, including Feeddler on iPhone/iPad, Mr. Reader on iPad, JustReader and News+ on Android. Luckily I don't need a mobile solution right away; I can wait and make a decision later. LOL, beat you by three weeks. I got the recommendation from my ipad app. Missing a week of cafe coffee to pay for the service. You discovered BazQux 3 weeks before I posted about it in May? I didn’t think they had any partners back then. The list disappears again after you increase the font size beyond a certain point. I signed up before you and spared myself the misery of kvetching about what to do. Serial signups is not a commitment. I set out Sunday night to completely abandon GR and replace it with an alternative. I went old timey desktop: Mozilla Thunderbird. It’s lovely having total control over feeds on my very own computer. I’m playing with feedly now. I notice that I don’t really bother to read my feeds if the title doesn’t attract me right away. It’s just not the same. I tried and loved BazQux – I just have a problem paying for a service that was free (yup -I’m cheap). I’ve also been playing with Inoreader and find it close to GR. I would have paid to keep GR going, and the reason I am paying for BazQux is that it enables me to pester the developer. Thank you for recommending BazQux. It is really fast and offers search. Hard to find both. I’ve signed up for Bazqux too. 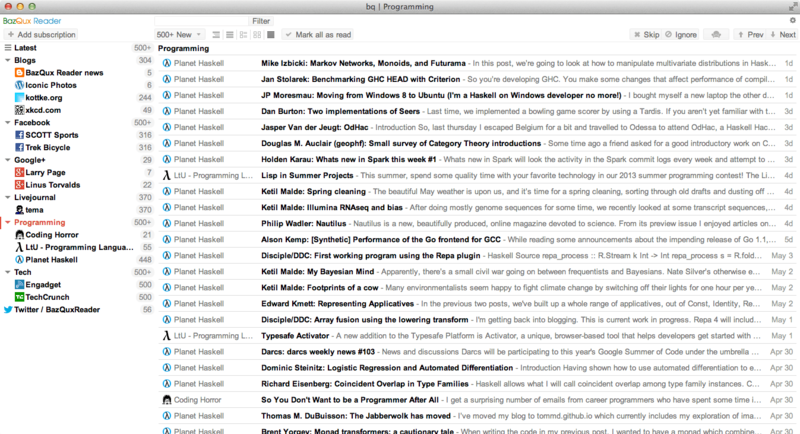 It’s an excellent Google Reader replacement. Integration with a mobile reader that I can leverage offline (on a plane, train or subway) is important to me too so I am pleased to see Bazqux is supported by Feeddler.